Clayton Melster watches his sister Kaitlyn present about easy ways to make businesses more accessible to patrons with physical handicaps. Last week I had the pleasure to attend Tiger Open Pathways student Kaitlyn Melster's passion presentation about simple ways businesses can increase accessibility for handicap customers. Kaitlyn was inspired to do this work because of her brother Clayton's struggle with such issues. During her presentation, Kaitlyn shared information about the history of the Americans with Disabilities Act and offered simple tips for businesses to support wheelchair-bound customer access. These include changing old door hardware to modern easy-to-grab models, moving obstacles from doorways and aisles, clearly marking all corners, steps, and edges to increase safety, and using people first language (as opposed to referring to people by their disability). Cañon City Schools is embarking on a series of construction projects aimed at improving school safety and handicap access, and as a result of her wonderful work, I'm setting up opportunities for Kaitlyn to advise our architects as they design new school entries and accessible restrooms and locker rooms. Her real-life perspective will be appreciated. Cañon City High School students once again put on an amazing spring musical for the community. This year audiences were treated to the classic Bye Bye Birdie. Though every performer made the performance special, I want to especially highlight the amazing talents of seniors Nicole Bechtel, Chris Hudson, Makenzie Konty, and Devin Peek. Their vocals, graceful moves, and their acting quality simply stole the show! I'm saddened to think we will never see them in a full-length performance on our stage again. CCHS students perform in closing night of Bye Bye Birdie. I also want to give a shout out to our board of education this week. Most don't realize the amount of time Larry, Lloyd, Mary Kay, Shad, and Kristyn invest in the work they do. Each carefully reads hours of district-related communication every week. They also constantly engage in school activities. A prime example of the dedication of these board directors was on display last week when President Larry Oddo and Vice-President Lloyd Harwood each attended to school board duties last Monday from 8 AM through ( PM, each positively participating in master agreement negotiations, then attending a board work session and regular meeting, followed by a School Safety Town Hall. Our kids deserve a board that is willing to work so hard for their benefit, and that is exactly what they have. 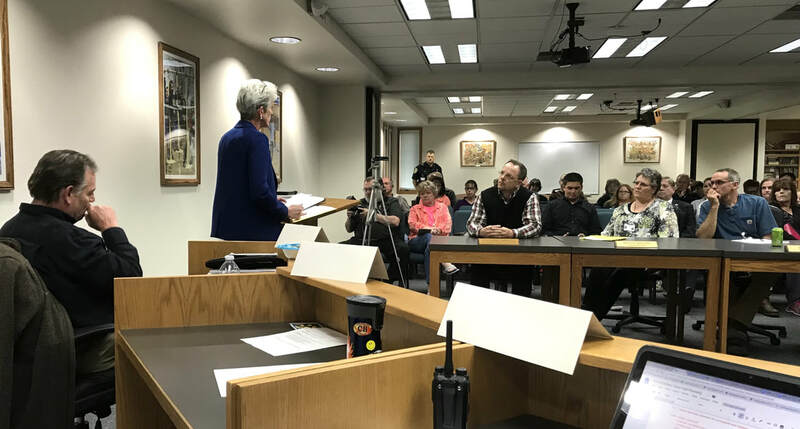 Speaking of our School Safety Town Hall, I have heard nothing but positive feedback about the event Director of Student Support Services Paula Buser organized last week. This was a great opportunity to share with our community the many things we are already doing, from policy to both proactive (counseling and social-emotional learning) to reactive (drills, procedures, safety and security initiatives) practices. Thank you, Paula, for all the work you did to organize this. Director of Student Support Services Paula Buser presents at our School Safety Town Hall. On Monday we held an 8-hour bargaining session with Cañon City Education Association leaders. We worked together through the Interest Based Strategies process, guided by Pikes Peak Education Association Uniserv Director Tim Cross, and accomplished quite a bit. Currently, committees are working on straw design improvements to agreement language we have agreed to work on. We have a follow-up meeting on the afternoon of Wednesday, April 25th. At our Superintendent's Advisory Council meeting on Tuesday, our big topic was preliminary budgeting and the creation of a staffing recommendation list for the board of education. At our District Accountability Committee meeting Tuesday evening we shared mid-year building evaluation results and set up an outline for next year's Unified Improvement Plan goals. Our big focus has remained on our one-to-one device implementation. Last week we worked on Policies related to student use and responsibility, and this week we will be making decisions about how to best use some of the lab devices that are currently located at Cañon City High School once each student is assigned a personal device. Last Tuesday we held a Design-Build team meeting aimed at trying out budget projections for our multi-facility repair work. This included attending to project details and creating a contingency wish list, should costs come in exactly as projected. Monday was a marathon day that began with an 8 AM to 4 PM certified agreement bargaining session, followed by a board work session, a regular board meeting, and then a School Safety Town Hall. On Tuesday I touched base with Director of Student Support Services Paula Buser about nutrition and school safety matters. I then attended a monthly CCPD meeting, held a SAC meeting, attended a Design-Build team meeting, conducted a Leadership Team meeting, observed a TOP student project presentation, then held a District Accountability Committee meeting. On Wednesday morning Director of Human Resources Misty Manchester and I touched base with CCESPA leadership. I then attended an Opportunity Coalition advocacy phone conference, hosted visitors from Cripple Creek Schools who want to learn about our override and bond projects, and ended the day attending the opening performance of this year's CCHS spring musical. I took a personal day on Thursday to spend time with my son who is visiting from Indianapolis, though I still worked on some electronic communications and attended a Rural Alliance advocacy phone conference. On Friday I attended a regional superintendent gathering, caught up on some communications, and navigated horribly windy weather to golf with my son. 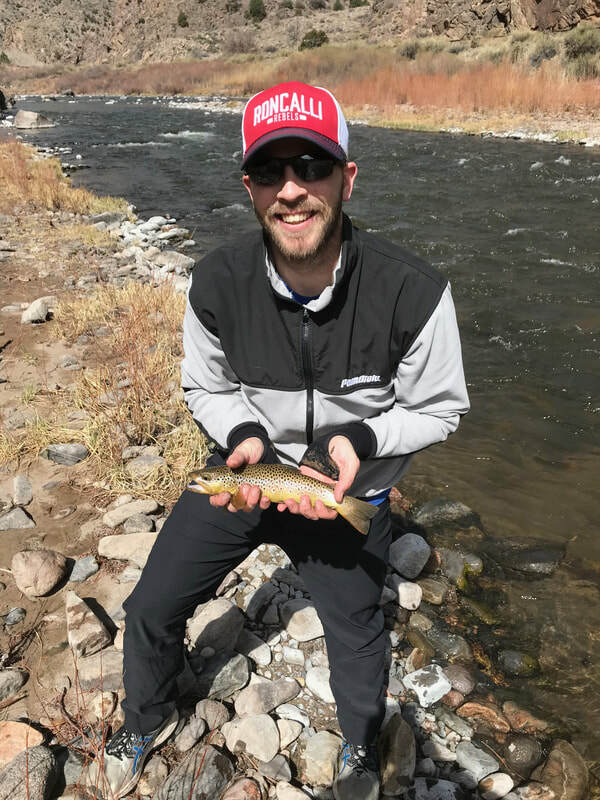 While visiting Cañon City last week my son Stefan got to fish the Arkansas, take in a CCHS performance, Golf 4-Mile, and shoot pictures of some of the amazing art installations around town. Having attended the CCHS spring musical last week this guy was one proud superintendent, and one proud Dad! I'll begin this week by catching up on some paperwork in the office including writing this communication, submitting district Unified Improvement Plans to CDE, and communicating details about our growth and development curriculum. I also get the opportunity to meet with Dan Morris from Colorado Digital Learning Solutions, observe student presentations in Ms. Curl's class at CCHS, and attend the Southern Superintendent's meeting in Pueblo. I'll also attend the Cañon City High School spring employer fair, the annual CASA luncheon, hold touching base meetings with Director of Special Services Lynnette Steinhoff and Director of Personnel Misty Manchester, attend another Cañon 2020 Vision team meeting, and meet with Director of Instruction Adam Hartman about the future of his department. On Friday evening I look forward to seeing board director Mary Kay Evans and her husband John inducted into the PCC Fremont Campus Hall of Fame. They are truly deserving of this honor.